Visit our Christmas tree farm for beautiful trees at reasonable prices. Tromp through the fields and cut your own tree with one of our saws or bring your own hand saw. ​We also have a nice selection of fresh-cut trees. ​for easy handling at no charge. 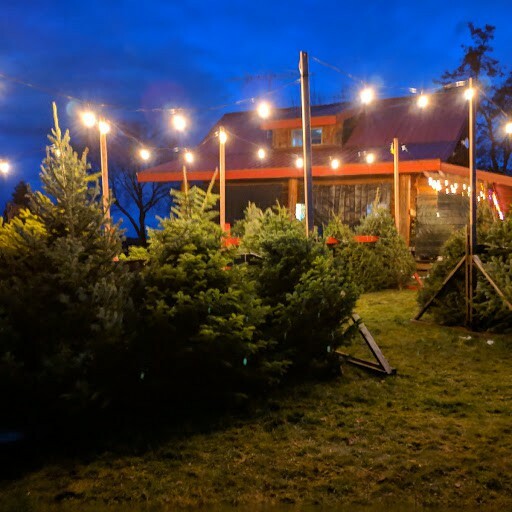 Bring the whole family out to the farm for a beautiful Christmas tree. and the drive is beautiful. and enjoy a wonderful day in the fresh air. We can haul your tree for you, or you can drag it out of the field yourself! John takes a break at the campfire. Our tree shaker removes most of the old needles. Wholesale trees ready to load. Your Christmas tree needs water. Give it a fresh cut (just like fresh flowers) before you put it in a water stand in your house. Once the tree warms up it will start drinking ... maybe a gallon a day or more for the first 4-5 days. Don't be surprised by how much your tree drinks. The tree will seal up and not drink again if the water level drops below the tree level. A lot of water those first few days is very important. We sell "StayReal Christmas Tree Watering Systems" to make tree watering easier for you: only $10.00!